In some other entries of the Pokemon Series the Fortune Teller has been known among fans as the nature lady, and the reason is pretty obvious – by consulting her and using her services, you can influence the natures of the Pokemon you encounter out in the wild. The same is true in Pokemon Let’s Go, but it’ll cost you. In Pokemon Let’s Go, the Nature Lady is found in Celadon City, the larger city in the middle of the map of Kanto – the one you’ll be frequently visiting in order to hit up their impressive department store. 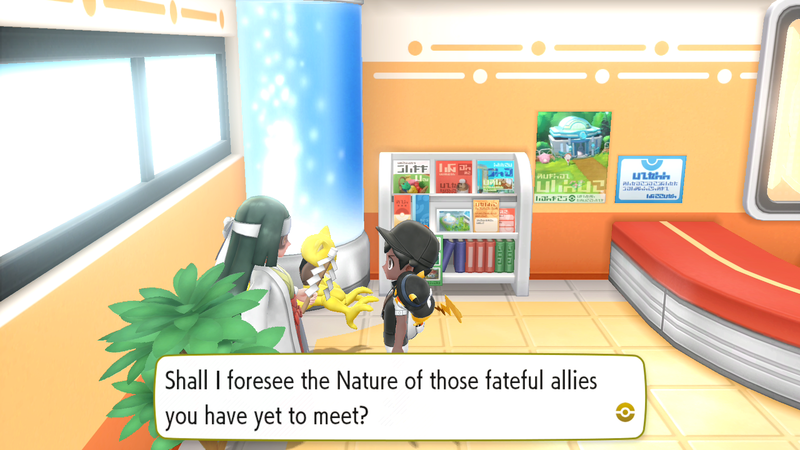 The Natures Lady hangs out in the left-hand corner of Celadon City’s Pokemon Center and, as befitting a Fortune Teller, is hanging out with her psychic-type Pokemon Abra. She looks like the women you saw in Pokemon Tower, clad in traditional dress. When you chat to her, the fortune teller offers to “forsee the Nature of those allies you have yet to meet” – but in truth she isn’t a fortune teller at all, but rather an influencer. Once you agree and pay up (her services cost a whopping 10,000 Poke Dollars), the fortune teller will ask you a series of questions about flowers. These may seem silly and useless, but these questions actually determine exactly what sort of Pokemon you encounter natures-wise for the rest of the day – the natures counter resets at midnight real-world time after being influenced by the natures lady. The fortune teller will ask you to water one color of flowers and thin another, cutting it back. This has the result of producing the nature that raises the stat you watered and lowers the stat that you decided to thin. If you water and thin the same flower, you’ll get a neutral nature – one that doesn’t raise or lower any stat, making for a completely balanced Pokemon. Here’s the flower combinations for watering and thinning explained plainly, so you can decide which to go for when you drop 10 grand on the Fortune Teller. Remember, her influence runs out at midnight – at that point you’ll have to pay her again.